Up in the air over pancakes . . . . . This week sees two great dates in the culinary calendar: February 22nd is Saint Peter's Day, one of the Patron Saints of Bakers, and February 25th is Shrove Tuesday which is also known as pancake day in the UK. So what better way to kill two birds with one stone than with a pancake recipe or two? 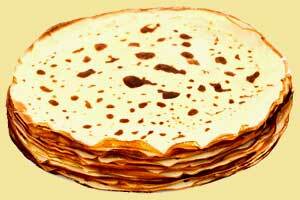 Lets look first at pancakes and what they are, as they are different things to different people, cultures and countries. But they all have one thing in common - they are all 'cakes' cooked in a frying pan . . . hence the name! There are sweet ones, there are savoury ones, there are very thin ones like the French crepes, there are thick ones like the English make and there are really thick ones like the German Pfannkucken. Then there are the American type that are served for breakfast. Which recipe will I be giving you? Let's go mad and have all of them and you can choose which ones you prefer! The final thickness of all the batters is very much down to experience, practice makes perfect as they say. It also depends on the flour one is using, a cup of one flour in the UK for example will probably yield a different thickness to a cup of flour in the US, this is due to the way the flour is processed. So again, how thick / thin your batter is, is decided in the end by making the batter and correcting accordingly. But before moving on to the recipes, the key to any of them is a good pan which should be non-stick in some form. Be this a domestic Teflon style or a professional well seasoned cast iron pan - without a good pan any recipe is doomed to failure. I have given suggestions on how each may be served but I am sure you will find many others that best suit how you like them. Needless to say you can also add flavouring (sweet or savoury) to the batters also such as cocoa powder, chopped chives, bacon bits, sweet corn kernels, etc. This batter makes fairly thick, heavy pancakes. Traditionally served sprinkled with castor sugar and lemon juice and jam if you prefer. These are always traditionally turned over by tossing them - a technique that must be practiced to stop them folding, not turning or being tossed so high they stick to the ceiling! Place sufficient peeled (optional) and cored apples around the pancake - add as much as you like, in a any pattern that you like. The apples may be slices, chopped, in rings, etc and as thick or thin as you prefer. Test the mixture before adjusting It should be easy to pour, but not so thin that it makes a crepe with holes. This unfortunately comes with experience and practice. How can you best serve these? This serving suggestion comes from a great e-pal in the States - Ruth of Illinois - who as you will see has a sweet tooth! Ruth suggests adding some cocoa to the crepe batter for a real decadent dessert! Enjoy your pancakes and bon appetit . . . . .